In Nigeria, a majority of the adult smoking population (15 years and above) consume tobacco primarily in the form of cigarettes. Nigeria has about 6 million adult smokers, or 5.6 percent smoking prevalence (GATS, 2017). 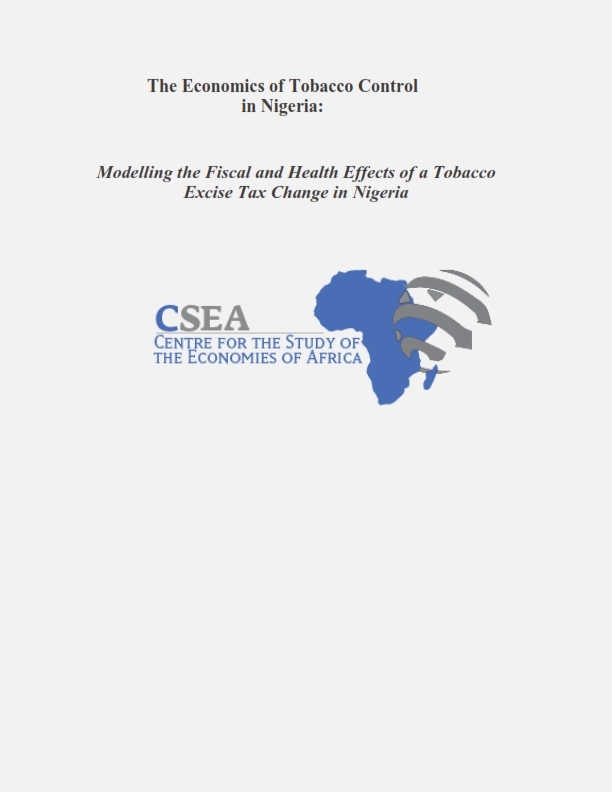 Smoking prevalence is significantly higher for men (at 10 percent) relative to women (1.1 percent), and 18 percent of Nigerian youths between the ages of 13 to 15 years smoke (GATS, 2017). A total of 920 million cigarette packs were consumed in Nigeria in 2015 (GlobalData Plc., 2016), of which 74 percent is domestically produced (NCS, 2015). Tobacco related diseases are responsible for about 17,500 deaths per year (about 207 men and 130 women per week) and about 250,000 cancer diagnoses (Tobacco Atlas, 2015). Economic losses in the form of medical treatments and loss of productivity from tobacco-related diseases is estimated at US$ 591 million in 2015 (Tobacco Atlas, 2015). Recently released media highlights show that Nigeria has dropped in terms of macroeconomic indicator rankings in 2018. With a headline index of 2.77, Nigeria is ranked 158th globally out of 181 countries five places lower than the previous year rankings. Indicators suggest that Nigeria is presently behind 28 other African countries, and just ahead of only 4 West African countries (Mauritania, Togo, Niger and Guinea Bissau). The Naira sustained its appreciation trajectory at the parallel market in the review week. Precisely, naira gained 13.3 percent (Week-on-Week) to exchange at N390/$ on March 24, 2017. Reduced pressure on the naira followed moderation in speculative activities as a result of increased forex sales and intervention by the CBN (daily intervention of $1.5 million at the interbank market.) The aim of CBN interventions (narrowing the gap between interbank and parallel market rates) seems to be on course with the continued appreciation of the naira at alternative markets. While current approach of the apex bank proves effective in improving international value of naira in the short term, however, it is expedient that the bank articulates clear and credible flexible exchange rate policy to sustain the momentum and enhance confidence in the forex market in the medium term. Nonetheless, the sustainability of the exchange rate gains is partly dependent on the prospect of crude oil price and production which is outside the purview of the monetary authorities.